Houghton Mifflin Harcourt, 9780547352206, 400pp. A compulsively readable, deeply human novel that examines our most basic and unquenchable emotion: want. With his critically acclaimed first novel, Jonathan Miles was widely praised as a comic genius “after something bigger” (David Ulin, Los Angeles Times) whose fiction was “not just philosophically but emotionally rewarding” (Richard Russo, New York Times Book Review, front cover). 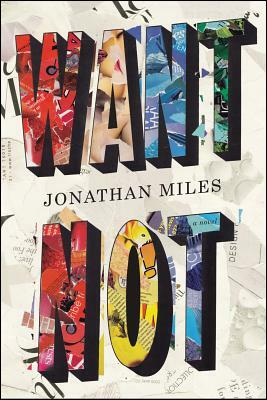 Now, in his much anticipated second novel, Want Not, Miles takes a giant leap forward with this highly inventive and corrosively funny story of our times, a three-pronged tale of human excess that sifts through the detritus of several disparate lives—lost loves, blown chances, countless words and deeds misdirected or misunderstood—all conjoined in their come-hell-or-high-water search for fulfillment. As the novel opens on Thanksgiving Day, readers are telescoped into three different worlds in various states of disrepair—a young freegan couple living off the grid in New York City; a once-prominent linguist, sacked at midlife by the dissolution of his marriage and his father’s losing battle with Alzheimer’s; and a self-made debt-collecting magnate, whose brute talent for squeezing money out of unlikely places has yielded him a royal existence, trophy wife included. Want and desire propel these characters forward toward something, anything, more, until their worlds collide, briefly, randomly, yet irrevocably, in a shattering ending that will haunt readers long after the last page is turned. With a satirist’s eye and a romantic’s heart, Miles captures the morass and comedy of contemporary life in all its excess. Bold, unblinking, unforgettable in its irony and pathos, Want Not is a wicked, bighearted literary novel that confirms the arrival of a major voice in American fiction. JONATHAN MILES's first novel, Dear American Airlines, was named a New York Times Notable Book and a Best Book of the Year by the Los Angeles Times and the Wall Street Journal. A former columnist for the New York Times, he serves as a contributing editor to magazines as diverse as Field & Stream and Details, and writes regularly for the New York Times Book Review and The Literary Review (UK). A former longtime resident of Oxford, Mississippi, he currently lives with his family in rural New Jersey.